I was very excited to see what the lovely people at Rusks and Rebels had sent me, and when I opened my parcel to find Haribo, I was over the moon! Neatly wrapped in a paper bag in their logo colours and sealed with a R&R logo sticker. How did they guess my haribo weakness? 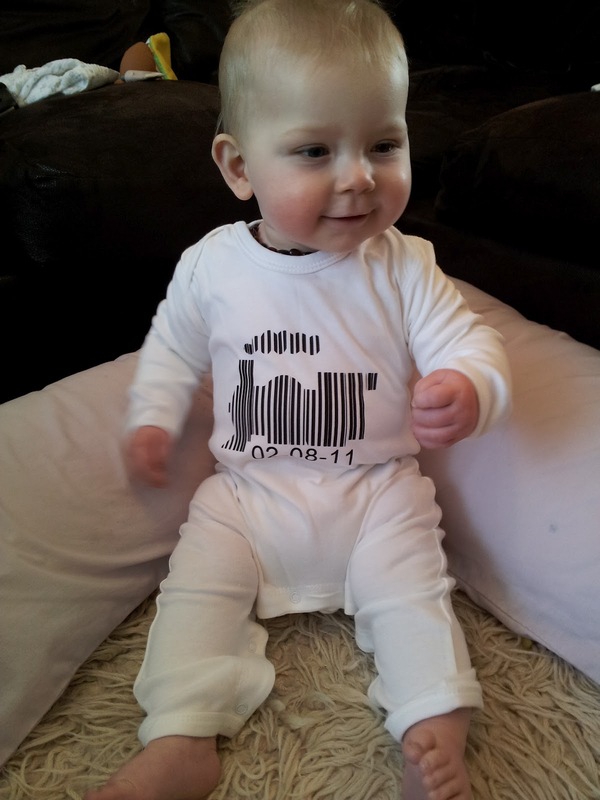 They had also sent something for Dylan, a beautiful white romper with a train barcode design and his date of birth on the front. 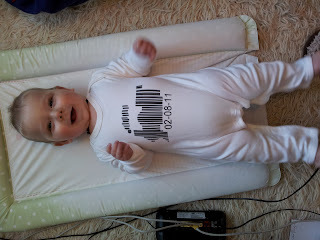 I love Dylan in traditional baby grows, especially for quiet days in as they look so comfy. This one has a funky edge in the brilliant print, and is something to add to the baby box as it is personalised in a unique way, with a birth date. I was very impressed with how lovely the material felt. It was thick, soft, felt very well made and I was excited about putting Dylan in it. I was equally impressed with the fit, as it was perfect on him, and even went over his cloth nappy ok. Not only did he look adorable, but the moment the last poppers were done up, he had his feet in his hands and was rolling over - obviously passed the comfort test too. These rompers would be the perfect present for a new baby as well as being comfy and practical for an older baby. The girl version has a baby carriage on the front and is equally cute. Rusks and Rebels also do some great T-shirts like this twitter tshirt and bodysuits- I love this '9 months inside' one. Rusks is for 0-2 year olds and the rebel side focuses on 2-12 year olds and has some equally cool clobber. I will definitely be buying presents for newborns from Rusks and Rebels in the future, as these personalised rompers are unique, funky and beautifully soft. I am also adding several things to my wishlist for Dylan! The personalised train and carriage rompers cost £15 each, and should be with you within 7 days of ordering. Mine came only 2 days after I sent Dylan's details, and they do offer a rush service if you need it in a hurry. The suit looks brilliant and made Dylan feel wonderfully cudley! The perfect Grandson!!! May need to get one of these for all newborns. There are some lovely places to get clothes from, I love things that are unique. Will check out Boys&Girls now! This is great - Charlie loves trains too, so I'm sure he'd want one for Oz!